The DC Motor Training System (DCMTS) is a PC based system used to teach the principles and operations of DC motors. The DCMTS can be controlled by both open and closed loop control modes, a requirement in understanding electronic control systems. The system comprises of a DC motor with potentiometer for speed control, forward and reverse LED indicators, and six 2mm colour coded sockets. The DCMTS can be connected to a PC through USB. The DC motor is connected to a 148:1 reduction gearbox fitted with a servo potentiometer and an optical encoder. The DCMTS is supplied with an interactive software program with a user friendly interface allowing the user to begin using the equipment with minimal setup. 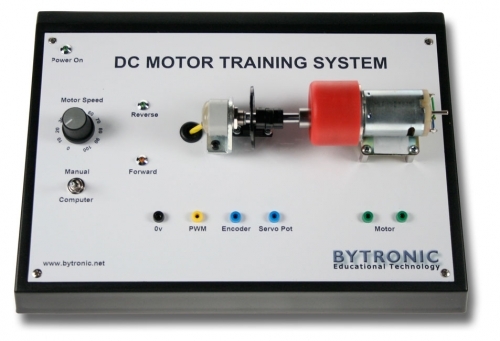 The software introduces the principles of DC motors, their application and control. The software includes questions and answers to allow the teacher to evaluate the knowledge of the student. The system comes complete with software, a USB lead and a power supply.